Today’s card is part 2 in my series on the Stampin Up Petal Palette stamp set and Petals & More dies. Today’s card is a beautiful design, versatile and great for many occasions. Think Birthday, Valentine’s day, Mother’s day and more. This was designed by Veronica. 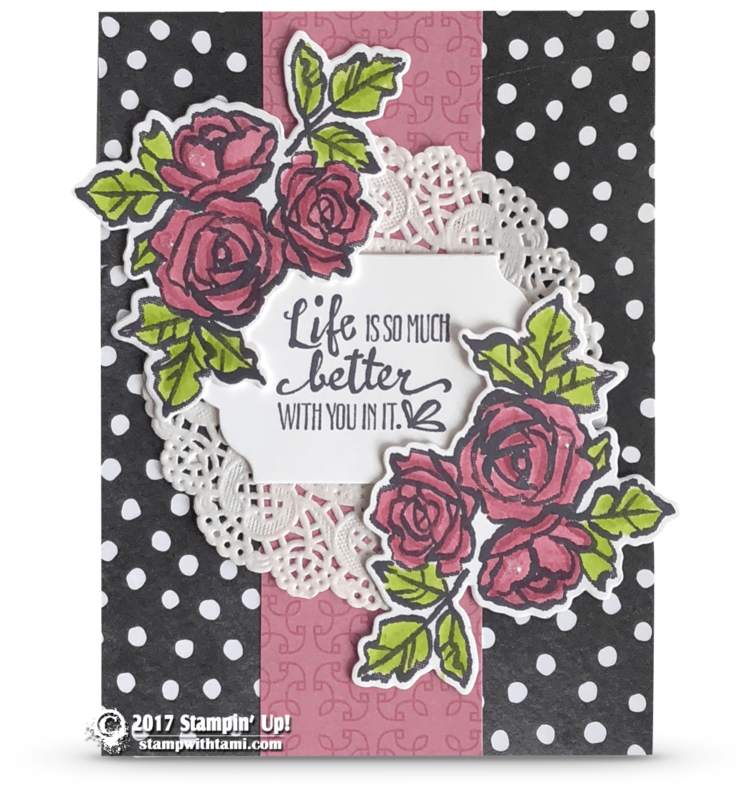 Using Archival Basic Black ink, stamp the words and 2 flower images on Whisper White scrap. Color in the flowers using Blender Pens and ink pads. (Click here for a video on how to do this coloring technique). Using the Big Shot Die Cut Machine: Cut the words using the Lots of Labels dies, and the flowers using the Petals and more dies. Assembly: Assemble the card with Snail Adhesive, using Dimensionals on the word and flower panels. Attach the the Glitter Epoxy Shapes on the roses for a “dew” effect. Measurements: White White Card Base = 11″ x 4-1/4″, Petal Passion DSP = 5-1/2″ x 4-1/4″, Petal Garden DSP = 5-1/2″ x 1-3/4″ and scraps of Whisper White for the die and flower cut out.